Inventive combinations, fresh produce and gorgeous presentation have made Tast-Ller one of Barcelona’s most highly rated restaurants. If you want to enjoy its charms, you’ll need to book well ahead. In a relaxed and likeably arty environment, diners enjoy beautifully presented food, prepared by owner and chef Mikel Peinador. There’s just one taster menu of around seven courses, with flavour combinations to excite and delight the palate. This is high-end dining with a personal touch, so expect a bill that fairly reflects this. As noted above, Tast-Ller offers one fixed-price tasting menu. This changes daily, according to what fresh produce Mikel comes across at the local markets. You can tell Mikel about any allergies, dietary restrictions or preferences when you book. Typically, the menu will comprise appetisers, three starters, a fish course, a meat course and desserts. Each course is necessarily small — this isn’t a medieval banquet — but packed with flavour.Food is beautifully cooked, with intriguing and delightful food combinations. Diners certainly won’t be lacking in variety. Desserts: mini ice cream, toffee – sand, chocolate mousse – cake – truffle, coffee, cheesecake, almond cake, rice pudding, macaron, marshmallows – passion fruit. All the courses are exquisitely plated. If you like to see food so pretty that you almost regret sticking your fork into it, Tast-Ller is the place for you. Don’t forget your phone or camera! One Trip Advisor visitor described the food at Tast-Ller as “fireworks of flavours and tastes”, which sums things up nicely. The restauranteurs’ strong visual flair is shown not only in the presentation of the food, but in every aspect of the surroundings. With unplastered brickwork and industrial-looking knick-knacks, it might be a New York loft apartment (complete with Jackson Pollack-style abstract). Even the plates are quirky and visually arresting. It’s self-consciously arty, nicely done, and adds up to a cosy and special ambience. Trip Advisor is great for getting the unvarnished truth about service, with every slip-up or disagreement documented. And in Tast-Ller’s case, the feedback is almost uniformly positive. Even diners who didn’t like the food – there are a few – raved about the warm and thoughtful service. Many diners are served by Mikel himself, who takes care to explain each course. And speaking of courses, given that there are seven to eight, you will be making an evening of it here. Expect your entire meal to take up to three hours. 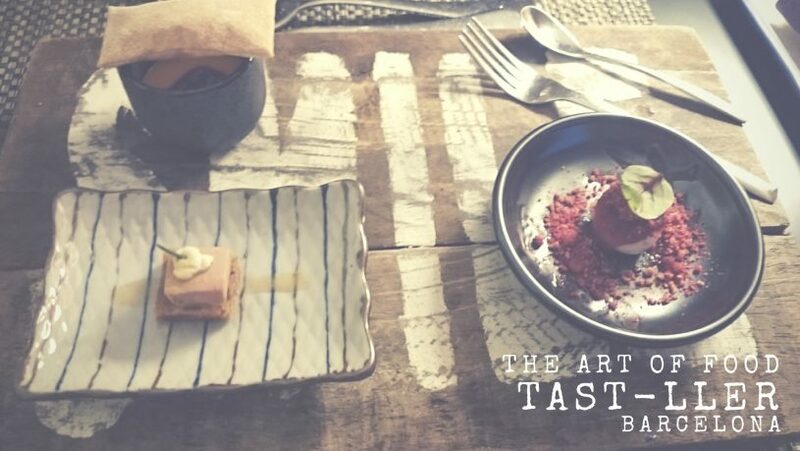 What would you expect to pay for a taster menu of high quality food, often served personally by the chef, in a restaurant that’s regularly booked out months in advance? Well, in Tast-Ller’s case, the answer is around 70 euros. That’s certainly not cheap, but we feel it’s not unreasonable for what’s on offer. A fixed menu, particularly one that includes adventurous flavour combinations, won’t be for everyone. There’s always a risk that on the day you visit, what’s been selected won’t be to your taste. You’ll need a certain amount of faith in the chef. However, the fact that Tast-Ller has the 8th highest rating on Trip Advisors suggests that the restaurant pleases most of the people most of the time. And with users making comments like “has to be the best restaurant I have ever eaten in”, you know that this is more than just a nice place to hang out. Tastler’s combination of fresh produce, culinary skill, beautiful presentation, great service and an intimate ambience is a winning one. Yes, a visit requires some organisation and costs a bit more, but it offers the promise of a memorable evening with some great food. You will need a reservation at Tast-Ller, and unless there’s a cancellation, it’s likely that you’ll be booking weeks or even months in advance (depending on the season). Don’t worry if you’re not linguistically gifted, Mikel and his staff speak excellent English. Once you’ve secured a booking, you’ll get a confirmation email. The restaurant will mail you again one week before your reservation. Make sure you reply to this or you risk losing your meal! Opening hours: Tuesday – Saturday, 19:00 -21:00. Closed Sunday and Monday.